Eagles’ Jason Kelce pauses during his speech at the Eagles Super Bowl Champions celebration at the Art Museum in Philadelphia on February 8, 2018. 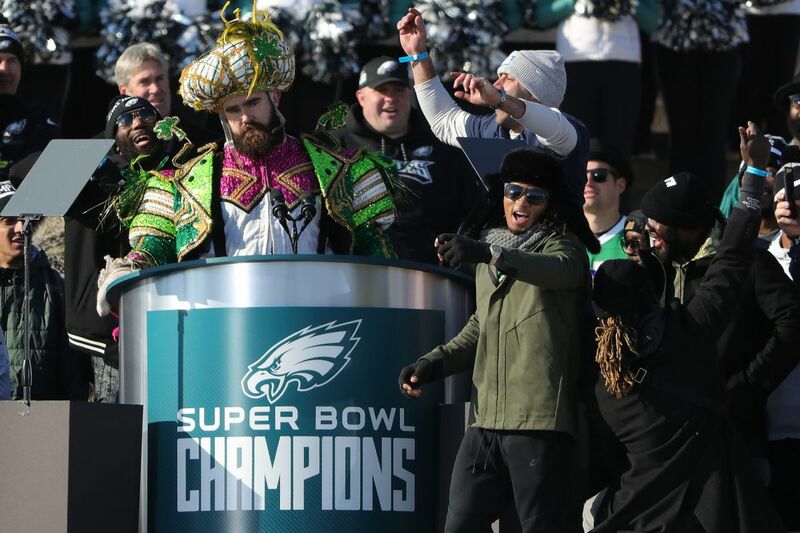 During Thursday's Super Bowl celebration, Eagles center Jason Kelce, dressed in Mummers garb, delivered an impassioned speech on the steps of the Philadelphia Museum of Art. Here is the full text, edited lightly for style and F-bombs. Go Birds! If you love the Eagles, let me get a "hell yeah." If you love the Philadelphia Eagles, let me get a "hell yeah." I'm going to take a second to talk to you about underdogs. I know Lane and Chris just talked about this, but I don't think it's been beat home enough. Howie Roseman, a few years ago, was relinquished of all control pretty much in this organization … He was put in the side of the building where I didn't see him for over a year. Two years ago, when they made a decision, he came out of there a different man. He came out of there with a purpose and a drive to make this possible. And I saw a different Howie Roseman. An underdog. When Doug Pederson was hired, he was rated as the worst coaching hire by a lot of freaking analysts out there in the media. This past off-season, some clown named Mike Lombardi told him that he was the least-qualified head coach in the NFL. You saw a driven Doug Pederson, a man who went for it on fourth down, went for it on fourth down … in the Super Bowl … with a trick play. He wasn't playing just to go mediocre. He's playing for a Super Bowl. And it don't stop with him. It does not stop with him. Jason Peters was told he was too old, didn't have it anymore. Before he got hurt, he was the best freaking tackle in the NFL. Big V was told he didn't have it. Stefen Wisniewski ain't good enough. Jason Kelce is too small. Lane Johnson can't lay off the juice. Carson Wentz didn't go to a Division I school. Nick Foles don't got it. LeGarrette Blount ain't got it anymore. Jay Ajayi can't stay healthy. Brandon Graham was drafted too high. Vinny Curry ain't got it. Beau Allen can't fit the scheme. Mychal Kendricks can't fit the scheme. It's the whole team. It's the whole team. This entire organization, with a bunch of driven men who accomplished something. We were a bunch of underdogs. And you know what an underdog is? It's a hungry dog. And Jeff Stoutland has had this in our building for five years — it's a quote in the O-line room that has stood on the wall for the last five years — "Hungry dogs run faster." And that's this team. Bottom line is, we wanted it more. All the players. All the coaches. The front office. Jeffrey Lurie. Everybody wanted it more. And that's why we're up here today. And that's why we're the first team in Eagles history to hold that freaking trophy. Any of you know who the biggest underdog is? It's y'all, Philadelphia. For 52 years, y'all have been waiting for this. You want to talk about an underdog? You want to talk about a hungry dog? For 52 years you've been starved of this championship. Everybody wonders why we're so mean. Everybody wonders why the Philadelphia Eagles' aren't the nicest fans. If I don't eat breakfast, I'm f–ing pissed off. No one wanted us. No one liked this team. No analyst liked this team to win the Super Bowl and nobody likes our fans. And you know what? I just heard one of the best chants this past day, and it's one of my favorites and it's new, and I hope you learn it. Because I'm about to drop it right now. You know what I got to say to all those people who doubted us, all those people that counted us out, and everybody who said we couldn't get it done? What my man Jay Ajayi just said: F– you! SINGING: "No one likes us. No one likes us. No one likes us. We don't care. We're from Philly. F–ing Philly. No one likes us. We don't care. No one likes us. No one likes us. No one likes us. We don't care. We're from Philly. F–ing Philly, No one likes us. We don't care."